Today Antutu reveals our list of the global top 10 best performing Android phones for October 2018. What are the best Android phones on the market right now? Check out our most updated top 10 list as measured by the average Antutu score. 1.Score: all the scores are averaged, not highest score per model (actual running results may fluctuate, which is a normal phenomenon). 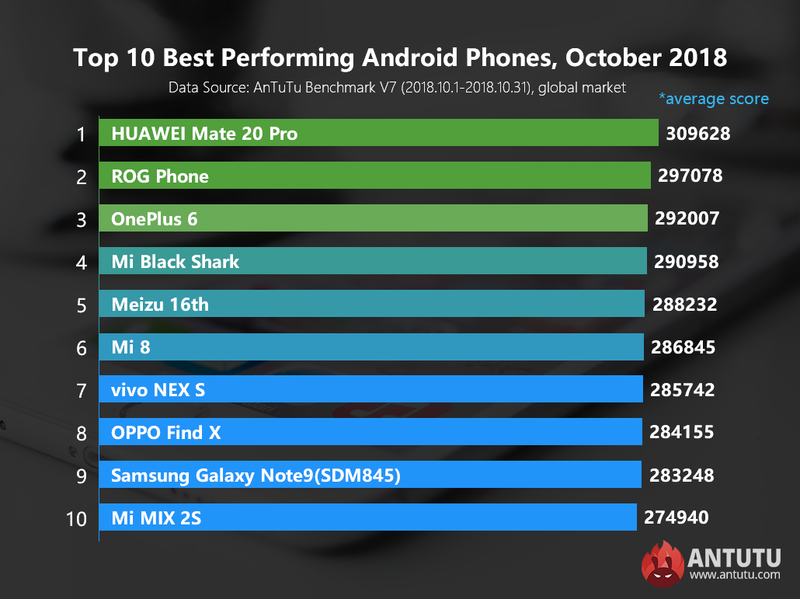 According to our October ranking, HUAWEI Mate 20 Pro powered by Kirin 980 processor topped the list with an average Antutu score of 309,628 points, which gives it more than 10,000-point lead over the Snapdragon 845-powered devices, making it the well-deserved king of the best performing Android phones so far. The second place goes to Asus ROG Phone. This model is powered by a speed-binned Snapdragon 845 running at a higher frequency than the standard Snapdragon 845, and gets an average Antutu score of 297,078 points, leading other Snapdragon 845 devices by over 5000 points. OnePlus 6 comes in third with an average Antutu score of 292, 007 points. Among all the smartphones powered by the standard Snapdragon 845, OnePlus 6 delivers the best performance. The rest of the list are as follows: Mi Black Shark, Meizu 16th, Mi 8，vivo NEX S，OPPO Find X, the Snapdragon 845-powered Galaxy Note 9 and Mi MIX 2S. In general, all the devices on the top 10 list are powered by Snapdragon 845 processor except for Huawei Mate 20 Pro which is powered by the Kirin 980 processor. At present, Snapdragon 845 is still one of the most powerful processors for Android devices. With regard to HUAWEI Mate 20 and Mate 20X, the average scores of these two devices are almost the same with that of HUAWEI Mate 20 Pro, ahead of Snapdragon 845-powered devices. However, since their scores reported to Antutu database didn’t reach our statistical requirement, they are not included in this month’s top 10 ranking list. With more scores of the two devices reported to Antutu database, the HUAWEI Mate 20 siblings are expected to sweep the top three positions in the November ranking. The above data reflects the changes of Android phone performance for October, 2018. For more information about the ranking list, please visit Antutu official website or download AnTuTu Benchmark and check in the menu of “Ranking”.